greetings dear dearies! 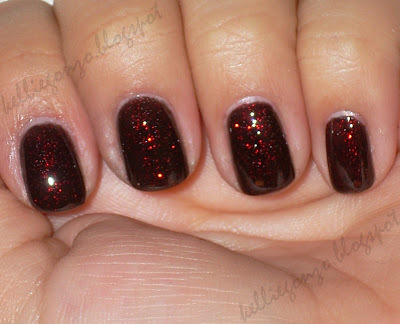 so this post is about china glaze's varnish lubu heels, which is a black polish with red micro glitter (kin to ruby pumps). 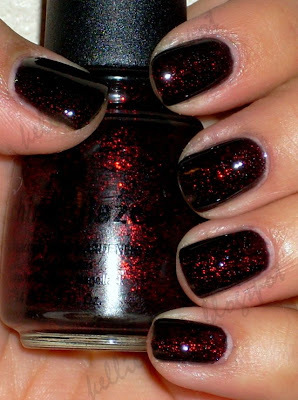 the polishes were released together to be used to do a Christian Louboutin shoe type manicure, which means the darker black lubu heels on top with the red ruby pumps on the underside of the nail like Louboutin shoes. i didn't do this because it seems ridiculously hard and i don't have the time :) although fun. maybe one day. 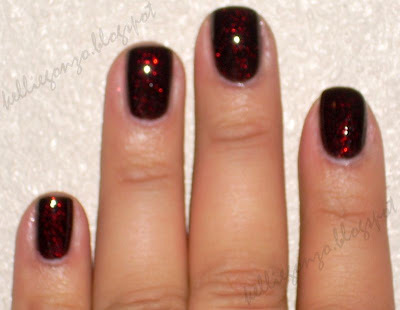 *flash* *blurry to see the glitter* i gotta say i mostly liked this polish in bright light and sunshine as indoors or under lamp light it looks pretty plain or slightly brown/burgundy. which is kind of disappointing. i used two coats, maybe three would've been better suited. it applied very well with the first coat being rather runnier than i expected. i noticed with some wear that one or two of the glitter pieces on top (even with seche vite) lost their pigment and became flat tin colored rather than red, which really annoyed me haha. it looked like a smudge or a dirt spot that i couldn't wipe away. not a big deal for normal folks, but for a perfectionist like me, i was going crazy. i look forward to this color on another day, as it is really beautiful. hope your weekends are going splendidly!